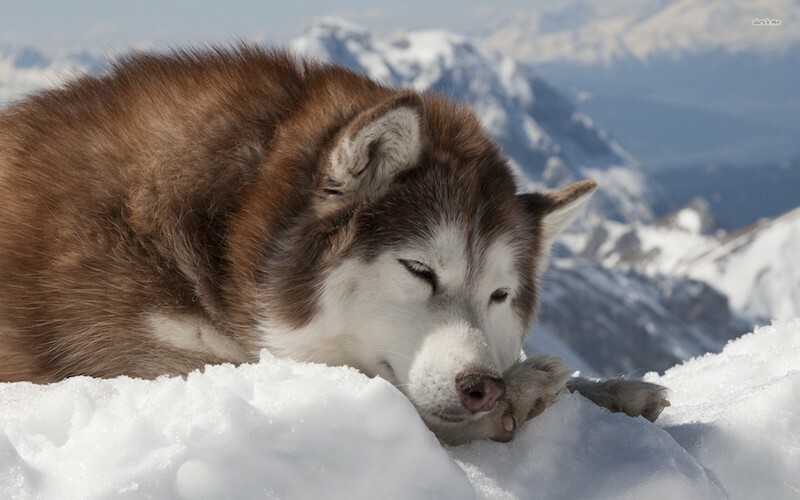 Alaskan Malamute, one of the oldest Arctic sled dogs, was named after the native Inuit tribe called Mahlemuts (now spelled Malamute) who settled along the shores of Kotzebue Sound in the upper western regions of Alaska. Written accounts of Alaska from various explorers and travellers rarely mention the Mahlemut people without reference to their dogs which were of the spitz-type described as being powerful looking and of remarkable endurance and fortitude. These dogs were used primarily as draught animals to haul heavy sleds, but were also used to pack supplies, for hunting seals and in packs to track polar bears. 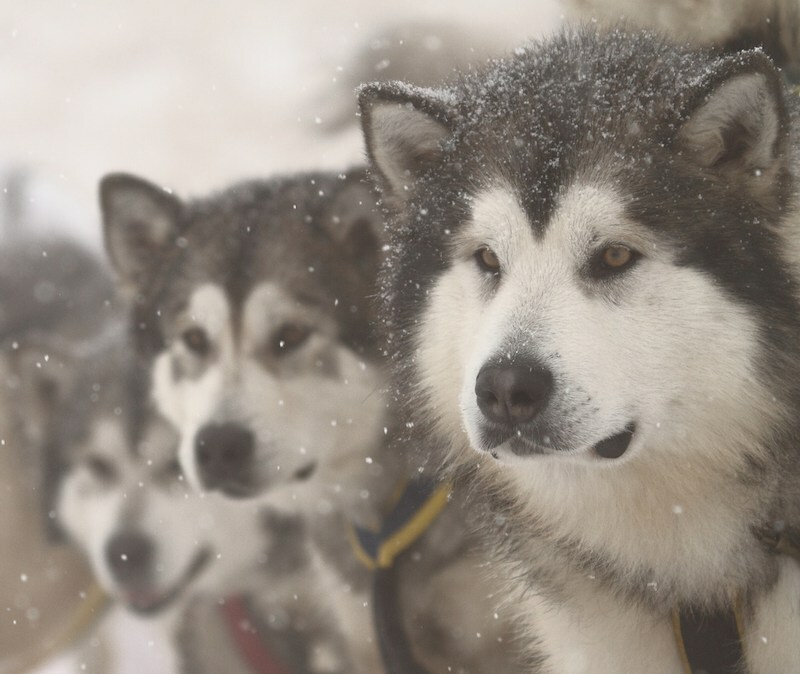 Early writings indicate that the dogs kept by the Mahlemut people were better cared for than was usual for Arctic sled dogs, and this seemingly accounts for the Alaskan Malamute dog breed’s affectionate disposition. General Appearance: The Alaskan Malamute is a powerful and substantially built dog with a deep chest and strong, well-muscled body. The Malamute stands well over the pads, and this stance gives the appearance of much activity and a proud carriage, with head erect and eyes alert showing interest and curiosity. The head is broad. Ears are triangular and erect when alerted. The muzzle is bulky, only slight diminishing in width from root to nose. The muzzle is not pointed or long, yet not stubby. The coat is thick with a coarse guard of sufficient length to protect a woolly undercoat. Malamutes are of various colours. Face markings are a distinguishing feature. These consist of a cap over the head, the face either all white or marked with a bar and/or mask. The tail is well furred, carried over the back, and has the appearance of a waving plume. The Malamute must be heavy boned dog with sound legs, good feet, deep chest and powerful shoulders, and have all of the other physical attributes necessary for the efficient performance of his job. The gait must be steady, balanced, tireless and totally efficient. 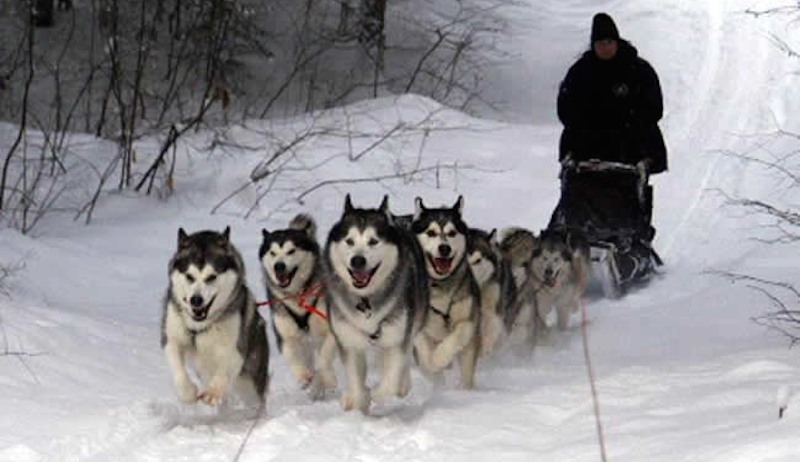 He is not intended as a racing sled dog designed to compete in speed trials. In judging Malamutes, their function as a sled dog for heavy freighting in the Arctic must be given consideration above all else. The degree to which a dog is penalized should depend upon the extent to which the dog deviates from the description of the ideal Malamute and the extent to which the particular fault would actually affect the working ability of the dog. The legs of the Malamute must indicate unusual strength and tremendous propelling power. 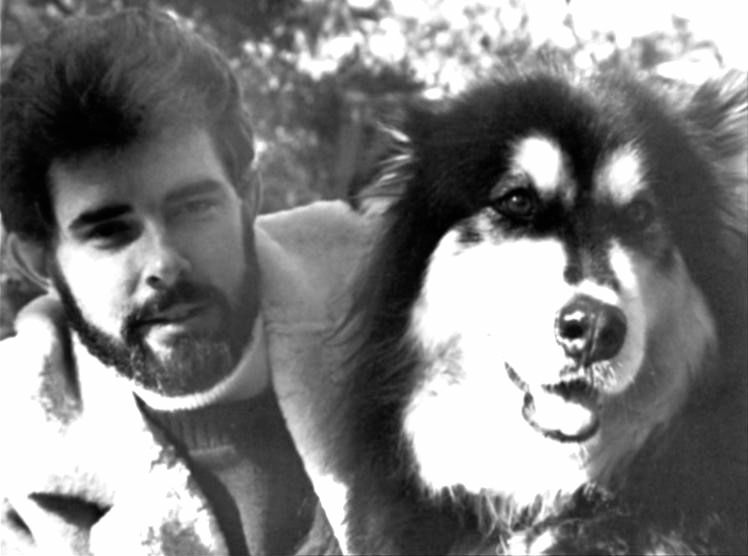 Image: George Lucas with his Alaskan Malamute Indiana in 1970s. 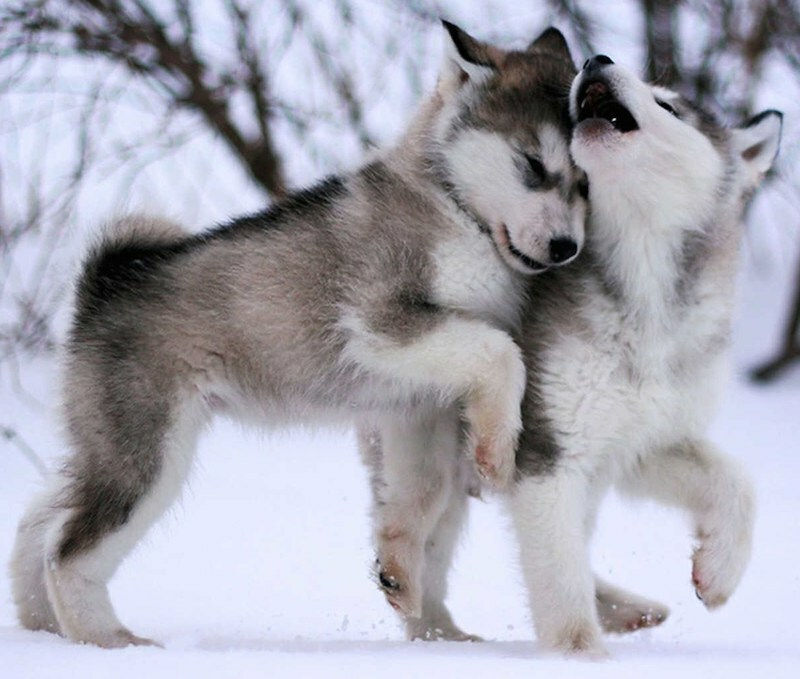 Alaskan Malamute Temperament: The Alaskan Malamute is an affectionate, friendly dog, not a one man dog. He is a loyal, devoted companion, playful in invitation, but generally impressive by his dignity after maturity. Size: There is a natural range in size in the breed. The desirable freighting sizes are males, 25 inches (63.5 cm) at the shoulders, 85 pounds (38.5 kg): females, 23 inches (58 cm) at the shoulders, 75 pounds (34 kg). However, size consideration should not outweigh that of type, proportion, movement and other functional attributes. When dogs are judged equal in type, proportion, movement, the dog nearest the desirable freighting size is to be preferred. The depth of chest is approximately one half the height of the dog at the shoulders, the deepest point being just behind the forelegs. The length of the body from point of shoulder to the rear point of pelvis is longer than the height of the body from ground to top of the withers. The body carries no excess weight, and bone is in proportion to size. Coat and Colour: The Malamute has a thick, coarse guard coat, never long and soft. The undercoat is dense, from one to two inches in depth, oily and woolly. The coarse guard coat varies in length, as does the undercoat. The coat is relatively short to medium along the sides of the body, with the length of the coat increasing around the shoulders and neck, down the back, over the rump, and in the breeching and plume. Malamutes usually have a shorter and less dense coat during the summer months. The Malamute is shown naturally. Trimming is not acceptable except to provide a cleancut appearance of feet. The usual colours range from light grey through intermediate shadings to black, sable and shadings of sable to red. Colour combinations are acceptable in undercoats, points, and trimmings. The only solid colour allowable is all white. White is always the predominant colour on underbody, parts of legs, feet, and part of face markings. A white blaze on the forehead and/or collar or a spot on the nape is attractive and acceptable. The Malamute is mantled, and broken colours extending over the body or uneven splashing are undesirable. Head: The head is broad and deep, not coarse or clumsy, but in proportion to the size of the dog. The expression is soft and indicates an affectionate disposition. The eyes are obliquely placed in the skull. Eyes are brown, almond shaped and of medium size. Dark eyes are preferred. The ears are of medium size, but small in proportion to the head. The ears are triangular in shape and slightly rounded at the tips. They are set wide apart on the outside back edges of the skull on line with the upper corner of the eye, giving ears the appearance, when erect, of standing off from the skull. Erect ears point slightly forward, but when the dog is at work, the ears are sometimes folded against the skull. The skull is broad and moderately rounded between the ears, gradually narrowing and flattening on top as it approaches the eyes, rounding off to cheeks that are moderately flat. There is a slight furrow between the eyes. The topline of the skull and the topline of the muzzle show a slight break downward from a straight line as they join. The muzzle is large and bulky in proportion to the size of the skull, diminishing slightly in width and depth from junction with the skull to the nose. In all coat colours, except reds, the nose, lips, and eye rims’ pigmentation is black. Brown is permitted in red dogs. The lighter streaked “snow nose” is acceptable. The lips are close fitting. The upper lower jaws are broad with large teeth The incisors meet with a scissors grip. Forequarters: The shoulders are moderately sloping; forelegs heavily boned and muscled, straight to the pasterns when viewed from the front. Pasterns are short and strong and slightly sloping when viewed from the side. The feet are of the snow-shoe type, tight and deep, with well-cushioned pads, giving a firm, compact appearance. The feet are large, toes tight fitting and well arched. There is a protective growth of hair between the toes. The pads are thick and tough; toenails short and strong. Body: The chest is well developed. The body is compactly built but not short coupled. The back is straight and gently sloping to the hips. The loins are hard and well muscled. The tail is moderately set and follows the line of the spine at the base. The tail is carried over the back when not working. It is not a snap tail or curled tight against the back, nor is it short furred like a fox brush. The Malamute tail is well furred and has the appearance of a waving plume. Hindquarters: The rear legs are broad and heavily muscled through the thighs; stifles moderately bent; hock joints are moderately bent and well let down. When viewed from the rear, the legs stand and move true in line with the movement of the front legs, not too close or too wide. Dewclaws on the rear legs are undesirable should be removed shortly after puppies are whelped. Gait: The gait of the Malamute is steady, balanced, and powerful. He is agile for his size and build. When viewed from the side, the hindquarters exhibit strong rear drive that is transmitted though a well-muscled loin to the forquarters. The forequarters receive the drive from the rear with a smooth reaching stride. When viewed from the front or from the rear, the legs move true in line, not too close or too wide. At a fast trot, the feet will converge toward the centreline of the body. A stilted gait, or any gait that is not completely efficient and tireless, is to be penalized. 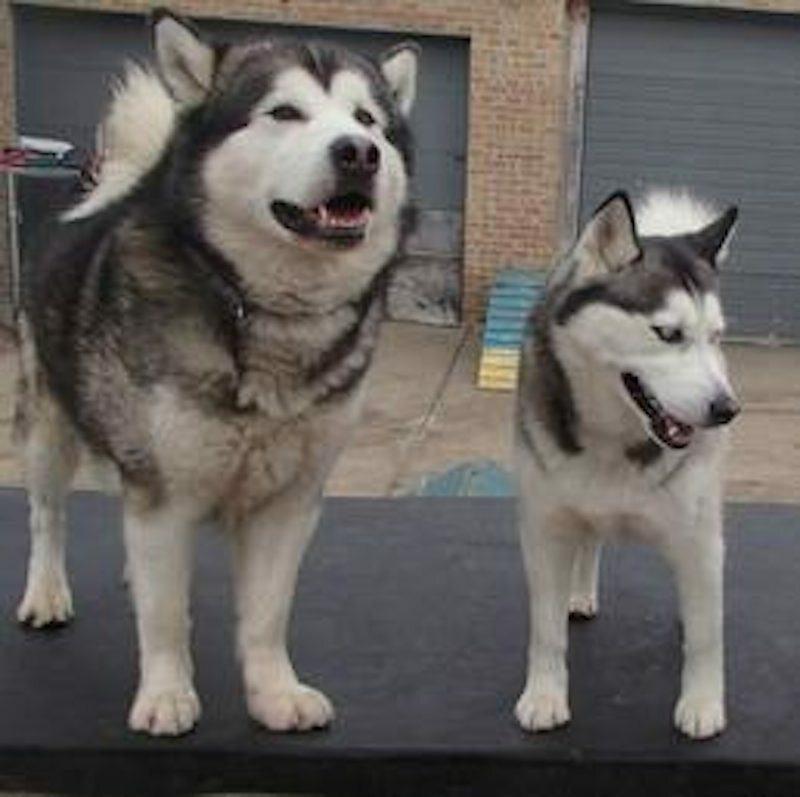 Alaskan Malamutes are sometimes confused with the Siberian Husky. 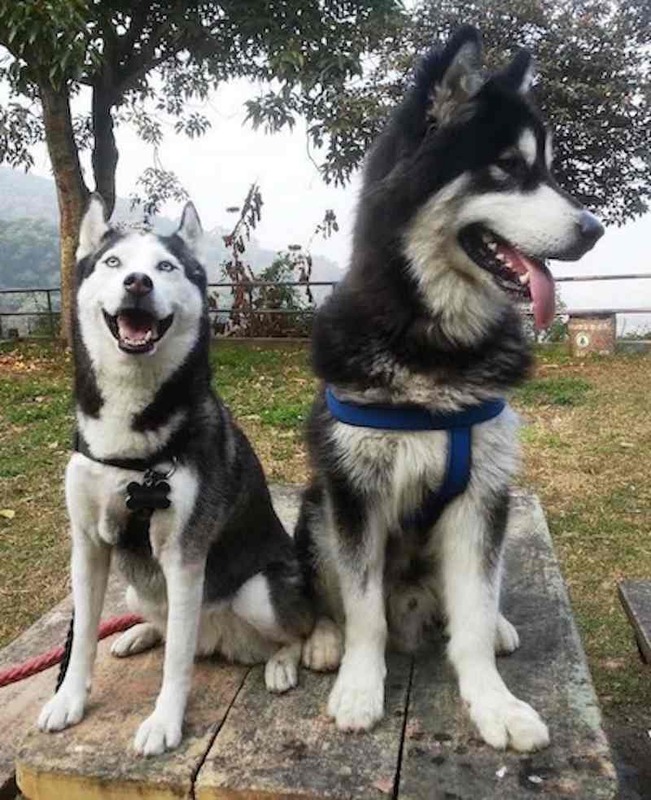 They both are sled dogs and have similar coat and colour. However, the Alaskan Malamute is a larger, heavier, hard worker who pulls heavy loads as compared to the blue eyed Siberian Husky. Faults: The Malamute is structured for strength and endurance, and any characteristic of the individual specimen, including temperament which interferes with the accomplishment of this purpose, is to be considered the most serious of faults. Any indication of unsoundness in legs and feet, front or rear, standing or moving is to be considered a serious fault. Faults under this provision would be spayed footedness, cowhocks, bad pasterns, straight shoulders, lack of angulation, stilted gait (or an gait that isn’t balanced, strong and steady), ranginess, shallowness, ponderousness, lightness of bone, and poor overall proportion. High set ears. Overshot or undershot. A long loin that may weaken the back. Disqualification: Blue eyes. Alaskan Malamute does not have blue eyes. Siberian Husky is the dog with blue eyes. Giant Alaskan Malamute: There is no such breed as a Giant Malamute. Selectively breeding for size alone has created what some people tout as a Giant. The inherent health problems of any large breed is usually exacerbated by this breeding strategy.